LONDON (AFP) – David Cameron finally took office as British premier Tuesday, ending his Conservative party's 13 years in opposition and vowing to form a "strong and stable" coalition after cliff-hanger polls. The 43-year-old -- who becomes Britain's youngest prime minister for some two centuries, with a pregnant wife -- was appointed after Gordon Brown admitted defeat after five days of political limbo. US President Barack Obama called Cameron within minutes of his appointment by Queen Elizabeth II, inviting him to visit the United States in July, while German Chancellor Angela Merkel was among others quickly on the phone. Speaking outside 10 Downing Street, the young Tory said he would form a "full" coalition government with the Liberal Democrats, who emerged as kingmakers from last week's indecisive elections. "I aim to form a proper and full coalition between the Conservatives and the Liberal Democrats," he said, flanked by his wife Samantha in a simple blue dress revealing her five-month pregnancy bump. "I believe that is the right way to provide this country with the strong, the stable, the good and decent government that I think we need so badly." Lib Dem head Nick Clegg was named deputy premier, while other appointments included George Osborne as chancellor -- facing daunting economic challenges including a eurozone crisis -- and William Hague as foreign minister. The dramatic confirmation of Britain's new leader came after days of uncertainty in the wake of Thursday's general election, which produced no clear winner for the first time since 1974. 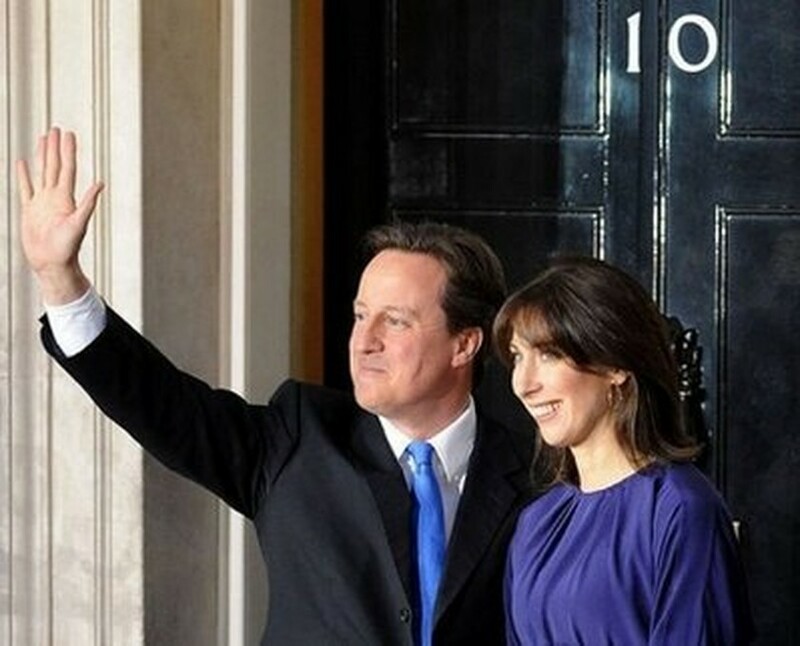 The country now faces being ruled by its first coalition government since World War II. Brown had announced he was quitting just an hour-and-a-half before Cameron walked through the famous 10 Downing Street front door. He wished Cameron well as he departed from top-level politics, while acknowledging the personal weaknesses -- such as poor presentational skills and impatience -- which hampered his three-year premiership. Brown then walked down Downing Street for the last time holding hands with his wife Sarah and their two young sons John and Fraser, who were making an extremely rare public appearance. Brown had said he would resign as Labour leader Monday but could have stayed on for several months as a caretaker had Labour struck a deal with the Lib Dems. He has spoken to his predecessor Tony Blair by phone. Labour deputy leader Harriet Harman will act as caretaker leader while a leadership campaign takes place, which is expected to conclude by September. Some 40 minutes later, Cameron arrived at the palace with his wife for a ceremony with the queen known as the kissing of hands. A statement from Buckingham Palace confirmed he had been asked to form a government. In last Thursday's general election, the Conservatives won 306 seats in the 650-member House of Commons -- 20 short of a clear majority of 326 -- followed by Labour on 258 and the Lib Dems on 57. After five days of talks between Nick Clegg's Lib Dems and Tories -- and briefly between the Lib Dems and Labour -- the two parties have struck a deal but this must also be approved by their lawmakers. Clegg -- who was leading a Liberal party into British government for the first time since David Lloyd George left power in 1922 -- was among five Lib Dem cabinet ministers in the new government, Downing Street said. Earlier Tuesday, Cameron had piled pressure on Clegg's party to decide which way to jump after he offered a referendum on their touchstone issue of electoral reform. Critics say the deal between the centre-right Conservatives and centrist Lib Dems is an unlikely alliance, since they have strongly differing views on issues like Europe, defence and immigration.